Now, there are several spice blends and most recipes have their own preferred blend. This ends up getting confusing and thus people turn to pre-blended mixes. The degree of flavor compromised doing this is very high and well worth the effort in making your blend. The first thing I teach students who walk into my classes is making a blend that I like to call my all in one blend. This blend very simply combines most of the common elements of spices mixes and is very versatile. I make a batch once every 3-4 months and store in an airtight spice jar. The kitchen smells amazing and food tastes flavorful. While this could be done in larger batches, whole spices retain their flavor longer than ground spices so it is best to make the spices in small batches. 1. 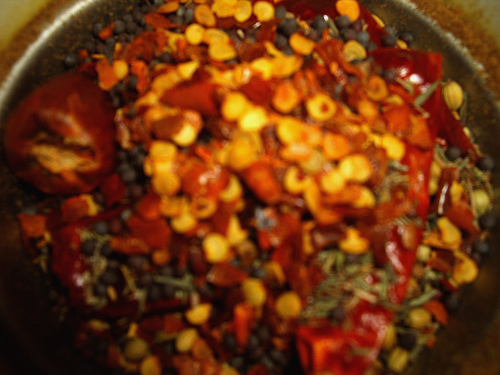 Place all the spices on a heavy bottomed skillet and dry roast them for about 3-4 minutes. This is being done to get the moisture out but not to cook them. 2. Cool slightly and place in a coffee mill and powder well. 3. Store in a dry airtight jar and use as needed. A very quick way of using this is to mix about 2 tbsp fresh lemon juice, with 2 tsp all in one mix. Toss about a pound of cubed salmon in this mixture and broil the fish.